The Zollverein Cube is a white cubic structure designed by the Japanese architectural duo SANAA and was completed in 2006. It is located at the entrance of the Zeche Zollverein in Essen, Germany. Before its closing in 1986, it was the biggest plant for mining hard coal, the Zeche is now a UNESCO heritage site. The original idea for the building stems from a masterplan by Rem Koolhaas/OMA which foresaw a landmark building at this location. 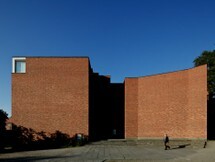 The cube was designed for the Zollverein School of Management but the school went into liquidation shortly after its foundation because it was not able to attract enough students. The construction for the building started in 2005 and it was completed a year later. A striking feature of the building is the concentration of windows at two opposite corners southwest and northeast. Their placement is not determined by (purely) aesthetic reasons. It takes into account the spaces' planned functions (library, computer workstation, conference room, etc.) and need for natural height. Only then the positioning was refined slightly to enhance the composure of the facade. Window frames were omitted on the exterior to provide a clear and sombre impression. Like the windows, the doors to the outside are all square and unequal in size. To underline the visual uniformity the doors do not stand out, the design being similar to the windows, only gravel paths which lead to the building indicate their positions. The cube's structure (35 x 35 x 34 meters) is straight forward and transparent. Recreation facilities, library and seminar rooms are separated through different floors. The only consistent elements are three detached nuclei of different sizes and two steel beams necessary to reduce the span of the ceilings. The flat ceiling is 50cm thick between the four outer walls, the three cores and the two supports never exceed sixteen meters. To reduce the ceiling dead load by 30%, spherical hollow plastic bodies were used as reinforcement. All the technical equipment then runs through the ceiling. Another feature of the building is its active thermal insulation. A 3000 meter long system of water pipes is embedded in the concrete walls. Warm water, which has to be pumped up from the mine every day to avoid flooding, is re-circulated from the mine through the pipes. The walls are warmed up not to heat the building, but for active thermal insulation. 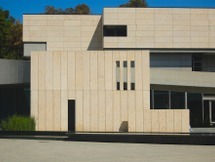 In 2010, it was decided that the building was to be used as a part of the Folkwang Universität, the local university. More proof that we have far too many uninhabited structures around the world for people to live in and work from. Why are we continuously builing more, new construction? To satisfy our egos? Time to get over ourselves.